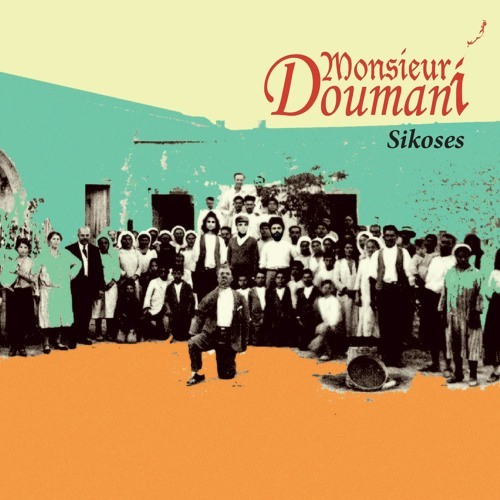 [Release date: 16.3.2015] [Label: Monsieur Doumani records] [Catalogue number: MD002] [Running time: 53:40] [Distribution: Proper] Sikoses is the second album by the Nicosia-based trio Monsieur Doumani. Their debut album Grippy Grappa, with its daring and innovative approach to Cypriot folk music, made Monsieur Doumani known to audiences around the globe, gaining them a nomination for Best Newcomer in the Songlines Music Awards 2014 and participation at WOMAD, Charlton Park, 2014. Despite the success of their debut, this time Monsieur Doumani has chosen not to follow the safe path, but to challenge themselves even further by venturing into unexplored fields. Adventurous and daring, they create original songs with reference to their rich Cypriot musical tradition. The group has moved to new territory, discovering a new voice, and experimenting with electronic sounds, while at the same time introducing elements from diverse musical styles. Folk music from parts of the world they have visited has been greatly influential in their new approach, (i.e. South Italy’s pizzica, folk music from Norway, the Balkans etc.) and is quite evident in Sikoses. Their lyrics are becoming increasingly relevant to their country’s social and political affairs, whilst always keeping their satirical and humorous mood, which is evidently one of the main characteristics of the band. This, in combination with their popularity, essentially renders the group as a vital activist voice on the island, against corruption, social injustice, class discrimination and racism. Ethnomusicologist Nicoletta Demetriou writes: “The title (of the album) is revealing: in the Greek Cypriot tradition, ‘Sikoses’ (a Cypriot term) mark the last day of feasting and meat consumption before the period of Lent begins. Significantly, Sikoses also mark the period of carnival, when people are allowed – even encouraged – to put masks on. The allegory chosen by Monsieur Doumani – the passage from the excesses of the previous period to sobriety and contemplation, and from disguising to revealing one’s true face – is telling”. The album Sikoses was produced in Nicosia, Cyprus by Monsieur Doumani and consists of 13 tracks, 10 of which are originals and 3 reworkings of traditional Cypriot pieces. Track number 11, ‘The pert breast’ is the only one composed by a non-band member, a good friend of the group, Symis Shukuroglou, who also features on the main vocals of the song. ‘The pert breast’ is also one of the two pieces that has a completely different musical approach and treatment in the album, the other one being the bonus track ‘A wee one’, sung by Antoniou’s partner, Efthymia Alphas. The album also features a piece with lyrics by the famous Cypriot poet Demetris Lipertis (1866-1937) (no.8 – ‘Dissonant judgement’) and another by Marios Epaminondas (no.6 – ‘That’s what the kitten wants’). Both songs are satirical and criticize the discrimination that exists between the classes. The album’s only instrumental piece ‘Mandra’ could be seen as a study on one of Cyprus’ most beautiful and distinctive melodies. Sikoses was recorded in Nicosia and mixed by Makis Pelopidas and Christos Kyriacoullis. It was mastered in Berlin at Masterlab Masteringstudios by Andreas Balaskas. The album’s cover is an old Cypriot photograph of unknown origin reworked by Antoniou and Lara Alphas. The design of the album’s layout is the work of Lara Alphas and Orestis Lambrou. More information can be found in the liner notes of the CD.